The Conservatives’ militarism is unrelenting. Last month the Harper government launched a Civil Military Leadership Pilot Initiative at the University of Alberta. The program “allow[s] people to simultaneously obtain a university degree while also gaining leadership experience in the Canadian Armed Forces (CAF) Reserves.” The four-year Civil Military Leadership Pilot Initiative will be “co-directed by the University of Alberta and the CAF” and the government hopes to export this “test model” to other universities. Huge sums of public money have been spent promoting the military at Canada Day festivities, the Calgary Stampede, the Canadian National Exhibition, Santa Claus Parades, the Grey Cup, NHL hockey games and other cultural and sporting events. Of recent, the Canadian Forces have been spending over $350 million a year and directing 650 staff members to carrying out these public relations efforts. 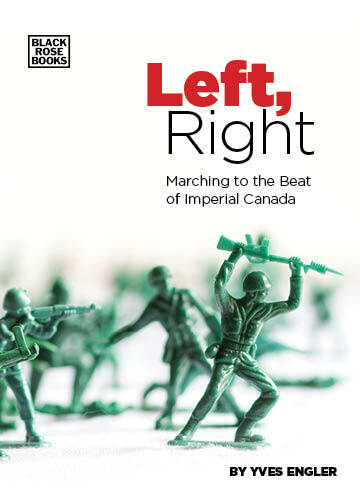 While strengthening the military’s role in the cultural and ideological arena, the Conservatives have also taken a decidedly pro-military position on arms control. Ottawa has refused to ratify the UN Arms Trade Treaty, which is designed to limit weapons from getting into conflict zones or into the hands of human rights violators. Along with its ambivalence towards UN arms control measures, the Conservatives have expanded the list of nations that Canadian defence companies can export prohibited weapons to. In April 2008 Canada’s Automatic Firearms Country Control List was increased from 20 to 31 states and in December they added Colombia, the worst human rights violator in the Americas, to the List. Now, they are looking to add four more countries to the Automatic Firearms Country Control List. During the Harper reign the CCC, whose board is appointed by the government, has taken on a more expansive role as a go-between on military sales with foreign governments. According to a June 2011 Embassy article, “the Canadian Commercial Corporation has been transformed from a low-profile Canadian intermediary agency to a major player in promoting Canadian global arms sales.” Traditionally, the CCC sold Canadian weaponry to the US Department of Defense under the 1956 Defence Production Sharing Agreement but during the Conservative government it’s begun emulating some aspects of the US defence department’s Foreign Military Sales program, which facilitates that country’s global arms sales. The Conservatives have worked hard to expand Canadian arms sales as well as to convince the public that it should support this country’s military-industrial complex.